After wrapping up the hunt with April, Ivan, Ron and Ronnie I had a few hours to get ready for Mike and Tyler. Luckily I had Zack helping me guide these two hunts so we were able to get everything ready before Mike and Tyler arrived. They were wanting to bow hunt for exotics, and would really like to try and get an axis with a bow. With it being late in the “axis season”, see previous blog for a better explanation, and the warm temperatures I knew it was going to be tough, but I was willing to try if they were. After getting them settled in and making a game plan we headed out for the Sunday afternoon hunt. It was approaching 100 degrees but as we walked toward the bowstand I noticed some blackbuck hanging out close to the stand. We snuck into the stand and didn’t spook the blackbuck very much and settled in for the afternoon. Unfortunately with the heat and swirling winds it was a pretty slow evening. No matter what you do in that heat it’s almost impossible to keep the animals from smelling you. It was much cooler Monday morning, but once again the light and variable winds were causing all kinds of trouble for us. We got in the stand early and had a lot of whitetail coming in to our stand, but as soon as they caught our scent it was all over. They started blowing at us and once that happens your hunt is pretty much over. With it still being fairly cool we decided to try a little fishing at one of the numerous ponds on the ranch. We’ve got some great fishing year around and in the winter months we even stock the river with huge rainbow trout. 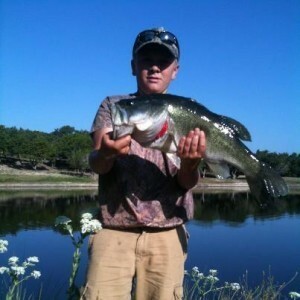 On his third cast, Tyler hooked this monster bass. After 2 bow hunts with not much action we decided to make a change and try and improve our odds, so we got out the rifles. As the afternoon sun began to fade we were seeing more and more animals. Right before dark we spotted a couple of really nice axis and Tyler and I tried to put a stalk on them, but things just didn’t work out. Early the next morning we were back in the truck with the rifles and right away we were seeing a lot of deer, both axis and whitetail. As we eased up one of the hills on the ranch I noticed 2 big axis bucks fighting. If you’ve never seen, or heard, axis bucks fight it’s quite an impressive sight. Tyler was just about to take a shot on the bigger of the 2 axis bucks when they broke the fight and started to chase each other. They had no idea we were there and as they dropped over the crest of the hill we knew we had a good chance to get back on them. Easing up towards the crest of the hill we could see the tips of their antlers through the trees but we needed them to move off a little more before we could get in position for a shot. We waited for what seemed like forever, but it was really only about 10 minutes, but they finally dropped off the edge of the hill. We knew the axis bucks were close, but as we eased up the hill we just couldn’t locate them. We took our time and slowly stalked along the top of the hill, but the two big axis bucks saw us before we saw them and took off down the hill. Hoping they would run up the other side, Tyler and I ran to the edge of the hill to try and locate them. Once again luck was on our side and the two big bucks started running up the hill across from us. Not knowing exactly what we were, or what spooked them, the bigger of the 2 bucks stopped and turned to look back and that was all the time we needed. Tyler made a great 221 yard kneeling shot to drop this huge axis buck!! After high fives and pictures the work really began. This axis buck had such a beautiful hide and such a big body that Mike and Tyler decided they would like him skinned for a full body mount. I’ve seen a lot of big axis bucks over the years, but this one was huge and will make a beautiful mount. The taxidermist is going to have to add quite a bit to the form for this big buck, but he’s going to look beautiful. With Tyler’s axis buck in the cooler it was Mike’s turn. After taking a break for lunch and to get out of the heat we headed back out that afternoon. We had some cloud cover and cooler temperatures and headed out quite a bit earlier. The cooler weather had the deer moving and it didn’t take us long to get on a real nice axis buck. The only problem was he got into the brush before we could get a shot on him. Mike, Tyler and I sat up under a big oak tree and Zack, who was helping me guide on this hunt, circled back to try and push the axis towards us. It worked perfectly. Zack pushed the axis right to us. The only problem was the big axis buck never presented us a clear shot and all the axis spooked before Mike could get a shot. We got back in the truck and the hunt was on again. The cloud cover was a big help and it didn’t take us long to locate some more axis. This time Mike wasn’t going to miss his opportunity. 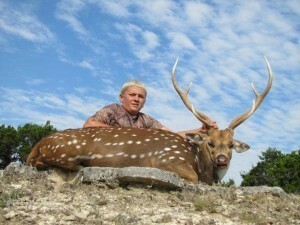 When the buck turned broadside, Mike made a perfect shot on this nice axis buck. With it still being early in the afternoon we dropped Mike’s axis buck off in the cooler and went back to the lodge, put the rifles away and grabbed the bows to go in search of a Texas Dall. 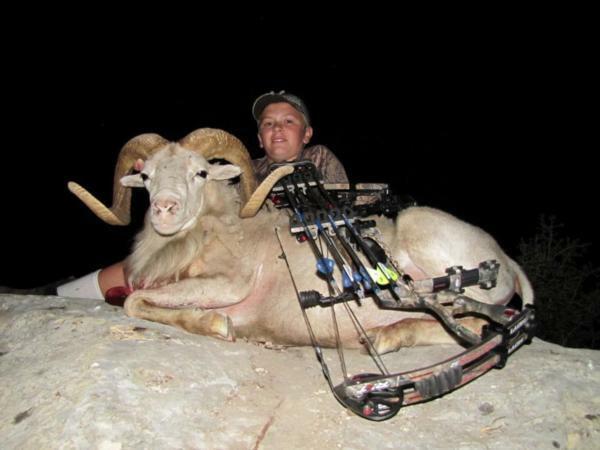 Sheep are always great to hunt with a bow and since Tyler had never harvested any exotic with his bow this would be a great opportunity. Luckily the Texas dall decided to cooperate and we were able to get Tyler close enough for a shot with his bow. Sheep are a lot more tough than people give them credit, but Tyler made a great shot. Unfortunately, with Tyler shooting a shorter draw length and lighter draw weight he just didn’t get enough penetration. Tyler’s shot was going to kill the Texas dall, but when we got back on him we decided the ethical thing to do was to have Mike, shooting a heavier draw and longer draw length, finish him off. Tyler and his 1st exotic bow kill…. Once again another great exotic hunt had come to a close and once again we were fortunate enough to harvest some great animals. Hunting with Mike and Tyler was a lot of fun and I really appreciate them taking the time out of their schedule and letting me take them on a hunt before Tyler had to start back to school. I also appreciate Zach delaying his departure to A&M Kingsville to help me guide one last hunt of the summer. I feel very blessed to get to do what I do for a living and hunts like this only reinforce those feelings. 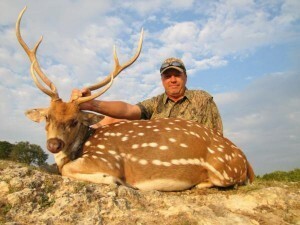 If you are interested to go Bow Hunting in Texas with me, let me know and fill out the form on my Book a Hunt page.